This is the story of a mount that addresses the biggest video wall problems installers face. This is also the story of our customers, who help inspire our design with valuable feedback at every step of development. Connecting these stories is the ConnexSys™ Video Wall Mounting System – Chief’s latest solution designed to save time and solve installation problems. Here’s how we did it. 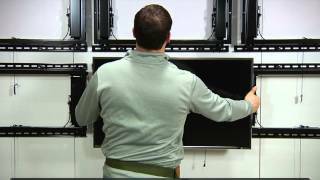 Watch as Chief's Mike Moon, Training & Installation Manager, demonstrates a 3x2 installation using the breakthrough new ConnexSys Video Wall Mounting System. Using strut channel to connect multiple mounts together, ConnexSys provides a simple-to-install system that improves the video wall experience in the areas of speed, alignment, serviceability and rigidity. Watch a 3x2 video wall installation using the ConnexSys Video Wall Mounting System to see all the features work together. The ConnexSys story started several years ago. Installers were having trouble with large video wall installations. Since no wall is perfectly straight, small imperfections get multiplied over space, and most mounts simply don’t adjust enough to compensate. A new solution was needed. The first step was to collect information from installers. “We spent an immense amount of time on customer empathy. It’s not that we didn’t do it in the past, but we did so much of it this time around it felt like what we did in the past was almost nothing,” said Greg Rupp, engineering supervisor. Chief's Kathryn Gaskell and Greg Rupp talk about gathering customer feedback and gaining empathy for ConnexSys. Kathryn Gaskell and Greg Rupp talk about gathering customer feedback and gaining empathy. Research revealed the four most common problems with video wall installations: Speed, Alignment, Serviceability, Rigidity. Armed with feedback from dozens of installers, the engineering team was assembled, including Mathew Schuh, design engineer, and Jay Dittmer, engineer. They started with a clean piece of paper. I think my favorite part is empathizing. Having empathy for the problem or the challenge. You put yourself in a person’s shoes who is going to be using it and what would they like to see. Solving one challenge at a time as they worked through the solution. Early on, the idea to use strut channel as an anchor entered the design and stuck. It provided a strong, flat base for quick leveling of a single row. For several days in a secret room at InfoComm 2013, Rupp and Kathryn Gaskell, product manager, met with 20 firms to gather feedback on the rough prototype they brought. Jay Dittmer, Mathew Schuh and Justin Nicolay discuss their biggest challenges and successes in designing ConnexSys. Mathew Schuh, Jay Dittmer and Justin Nicolay discuss their biggest challenges and successes in designing ConnexSys. Gaskell says the meetings at InfoComm helped guide the next design stages and clarified other decisions. It was clear a new release system and more stability were needed. Justin Nicolay, a mechanical designer who started at Chief in June 2013, was tasked with devising a new release system. His bike restoration hobby came in handy at this point by leading him to a system that uses a bike brake mechanism for consistent, controlled display access. At the end of the summer, it was time once again to return to customers for a fresh look at the solution. One such person was Vince DiStasio, vice president of Video Visions, Inc. in Trevose, Penn. I want it to be simple to install … If it can make someone’s job easier, make their install quicker, make life easier – that’s the main goal right there. The reaction was the same wherever the Chief team took it. The last customers who saw the new system asked when they could order it. Steve Durkee talks about the power of customer collaboration in developing ConnexSys. Greg Rupp getting ready to test prototype ConnexSys mounts. Mounting strut channel for an installation test. Greg Rupp hangs a prototype LVS1U. Mike Moon and Kathryn Gaskell test the extension during the prototype install. Evaluating the kickstand and display access for install and maintenance. Greg Rupp examines the ClickConnect latching system. Leveling displays to gauge accuracy while aligning the video wall. Kathryn Gaskell and Jay Dittmer test out the RapidDraw display release. Another round of prototypes are installed and tested to ensure proper functionality. A close-up look at some of the PowerZone micro-adjustments. Rupp started at Chief out of college 10 years ago and worked his way up to his current supervisory role. He has always been “a tinkerer and builder.” He helps oversee 4-6 large-scale projects a year along with dozens of smaller solutions. Dittmer is Chief’s first employee. He started in 1977 at the age of 15 working for his friend’s father, the founder of Chief. Dittmer has a competitive appreciation for design and pushes himself with every new solution. In his years at Chief, his name has been listed with more than 75 patents. Nicolay joined the project team over the summer. A constant tinkerer who builds arcade games and restores bicycles in his spare time, he previously worked for a door manufacturer. Schuh has worked at Chief for six years, working on large solutions and their accompanying accessories. Schuh enjoys the creative problem solving inherent in design – to narrow the infinite possibilities down to a finished project to see how efficient he can be while best addressing the problem. Prior to Chief, Gaskell worked at a commercial humidification company that made systems for hospitals and museums. As a product manager, she fits into the Chief design thinking ethos well – she loves working with customers to understand their pain points.